I’m sure I sound like an old geezer by reminiscing about the old days. I remember dentistry WITHOUT dental websites. Do you remember those days? For a few hours each year we would meet with our local phone book representative, pick the size of ad that we wanted to run in the Yellow Pages. We would pick some colors, look at some stock photos, go over a few dental phrases, and within a few minutes our dental office marketing would be done for the year. We would then wait for the phone book to come out, and when it did, we would pass it around the office for all to see, and compare it to all the other dental offices in the area. Life was so simple back then. Websites added a whole new dimension to dentistry. As the years have progressed, I have enjoyed looking at dental websites. 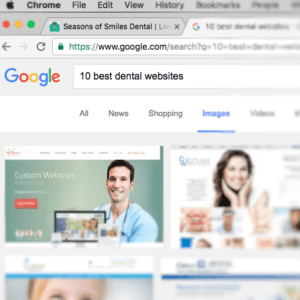 Here are my personal favorite 10 dental office websites. # 10 http://atlantadentalspa.com I recently stumbled across this website. It is a big website, but it has so many features of what I feel make a great website. The website has numerous video clips of patients and staff. They have a video clip of one of the Atlanta Falcons cheerleader. How cool is that? They also have video clips of their hygienists introducing themselves which I think it makes it feel authentic. The website is made using Wordpress, which I’m a fan of. This website is more that just a yellow page ad, it falls into the realm of a great dental education tool as well. This website has a lot of depth. Hmmm, I wonder how our staff would feel about making video clips where they are featured? # 9 http://www.billdorfmandds.com I had the privilege of listening to Dr. Dorfmann a few years back. I walked away very impressed. He advertises and he is the dentist to the stars in Hollywood. It makes me chuckle every time I go to his website and see Ozzy Osbourne on his front page. On a side note, Dr. Dorfmann has 601 Google Reviews coming in with an average of 5.0! This guy is for real, and his website reflects nicely who he is. # 7 http://mypanamacitysmiles.com Panama City Smiles – I just love this WordPress website. It’s so pleasing to look at. It takes me to the beach with those pleasing happy colors. The website collapses nicely when you grab the corner and resize the window, it’s a great example of a responsive website. In my opinion I think the website would be better served with real photos of actual patients instead of stock dental photos. The “Smile Gallery” is a bit ambiguous; are the before and after pictures actually patients? I think actual cases are more convincing. The website needs a blog. # 6 http://leeannbrady.com/ I remember the fist time I saw Dr. Brady’s website. The pictures caught my attention. The website feels very authentic, and while most dental websites are designed for dental patients, I think this website is being used as a tool to reach out to other dentists. I think this is a great example of dentists who do their own website, and a “blog” button would be very helpful here. # 5 http://meadfamilydental.com – If my memory serves me correctly I found this website on google. This website fascinates me. I have always thought of the blog portion of the website as the motor that makes the website SEO move. What the website designer implemented here is a website that is 100% blog. The homepage is the blog. In my mind this website is all motor. I also like the responsive nature of this website. # 4 http://www.smilesbypayet.com A while back our blog was listed in Top 100 Must Read Dental Blogs for Every Dentists. Where as we came in #55, Dr. Payet’s blog came in numb 58. I feel flattered that our website was even in the same list as his. Dentistry is Dr. Payet’s passion and as you read through his blog it shows. The blog on this dental website is authentic and I think it adds so much more. My Top Three Favorites Dental websites. # 3 http://drkenmurphy.com This has been my number 1 dental website for years and I just love this website. This is one website where I would love to meet the designer. Was this website built by one person, or was it a team? Did a website designer design the website using Photoshop and then parse out the work for the Wordpress programmer to implement? Or did one person design and implement? I sure would like to meet the responsible party. Even though I am not a fan of stock dental photos, this is the best looking slider ever. I’m assuming that the back photo is the skyline of Atlanta? Unfortunately, websites age fast. Sometimes I think their age can be measured in “dog” years, and this website is showing it’s age. The website is not responsive. The website has no blog. Even though you can leave a “quick contact” on the homepage the website is not SSL secured. Whereas we as dentists take patient confidentiality very seriously, anytime we take patient information online, it needs to be SSL secured. # 2 http://mirandalacydds.com This website is definitely in my top two favorites. Depending on when you ask me, this one comes in at number one. I don’t know if it’s the white website, or the simpleness of it all, but I find it very appealing. Although this is one of my top favorites, a few observations about this website are that the blog needs to be listed on the main menu. There is a disconnect between the website and the blog, and the blog needs photos. The upside of having a simple website is that it is blazing fast. This might be the fastest Wordpress dental website that I am aware of. # 1 http://www.pediatricdentistalexandriava.com/ I absolutely love everything about this website. The menu quivers when you hover over the different options. The colors work well together. The dental office logo is nicely used throughout. Maybe it’s a good thing it doesn’t have a blog. It feels so good the way it is, maybe an ever changing blog would distract from the completeness of it. The website designers constructed the website using Plesk? I have no idea what Plesk is. I wonder why not WordPress? This website and logo are done by Practice Cafe. On a side note, Practice Cafe’s website is done using Wordpress, and it truly is a thing of beauty. Go check it out. When you have free time, do you like looking at Dental website as well? What are your WordPress favorites? If you have a dental website that you think looks great and would like to share, we would love to see it. Please leave a comment with the WordPress dental website listed. I’d like to see what your feedback would be for these two sites compared to the ten listed above! Hello Christian, I love both websites. They’re beautiful. Thanks for stopping by. Give Dr. Clint Newman my best.